This Chocolate Cake with Chocolate Mousse Filling belongs in a baking contest! It’s a simply amazing moist chocolate cake filled with dark chocolate mousse, and a warm chocolate frosting poured on top! I probably developed a love for baking before my love for general cooking. As a little girl my idea of fun was inventing cookie recipes. My mom would my sister and me have free reign in the kitchen to experiment with our friends. The cookies never turned out great but it was such a fun learning experience for us and we just loved creating something out of nothing, even if it didn’t taste great. That’s what I love about baking. You can create something beautiful and amazing out of the most simple ingredients! This Chocolate Cake with Chocolate Mousse filling is the perfect example of that. 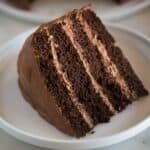 An easy homemade chocolate cake recipe, paired with the simplest mousse recipe you will ever find, but put them together and you create a masterpiece! 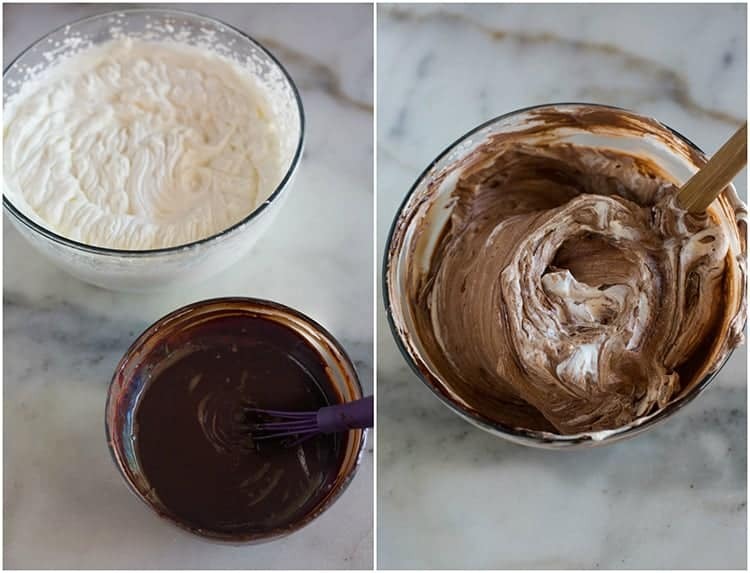 How do you make chocolate mousse? The ingredients you need to make chocolate mousse are really simple: water, cocoa powder, chocolate chips, whipped cream, and sugar. Start by mixing the cocoa powder and hot water together until smooth. Melt the chocolate chips in the microwave, or using a double boiler. I use toll house or Ghirardelli brand chocolate chips and follow the instructions on the package for melting them in the microwave. Add the cocoa powder mixture to the melted chocolate and stir until smooth. Allow to cool to room temperature. Whip the cream and sugar together in a large mixing bowl until very stiff peaks. Add the cooled melted chocolate and gently fold the mixture together to combine. Refrigerate until ready to use. This easy chocolate mousse recipe does not use eggs, like some recipes, and will last in the fridge in an airtight container for up to 5 days. Fold it again gently with a spatula before using. How do you make chocolate mousse cake? This chocolate mousse cake has three parts: chocolate cake, homemade chocolate mousse, and chocolate frosting. If you don’t want to make the cake from scratch, you could use a box cake mix. Start by baking the chocolate cake in two 8 or 9 inch round cake pans. Once the cakes have cooled use a sharp serrated knife to torte them in half, lengthwise, so you have four thin layers of chocolate cake. Place the first cake layer on your serving tray. Smooth a thin layer of chocolate mousse over it, and top with the next layer of cake. 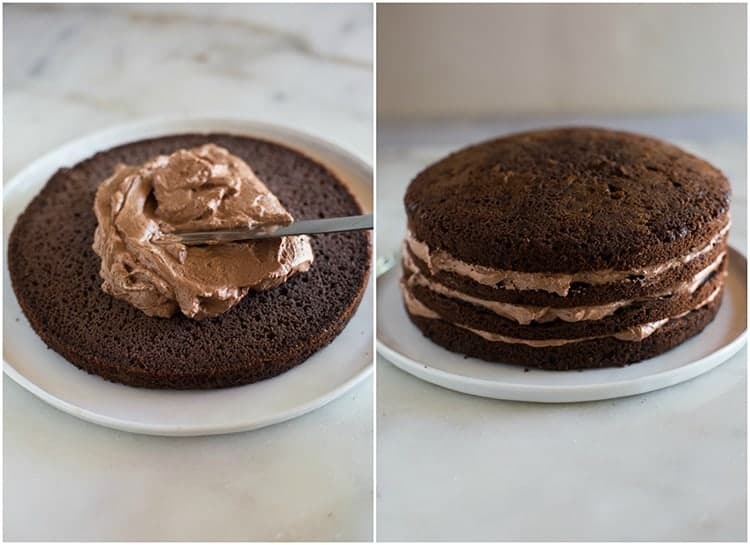 Repeat to assemble a cake with chocolate mousse between each layer. You can smooth any extra chocolate mousse you have over the outsides of the entire cake to make a”crumb” coat and seal in all of the crumbs. 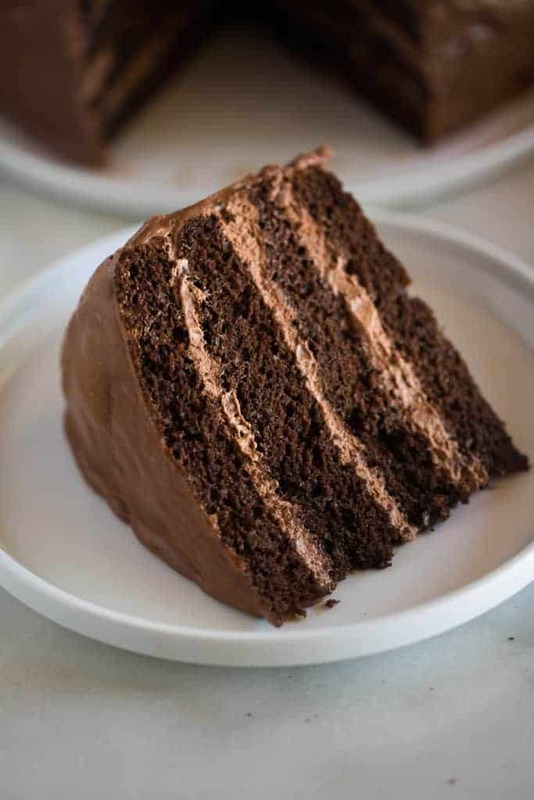 Refrigerate the cake for at least 30 minutes (or up to 1-2 days, covered) while you make the chocolate frosting. 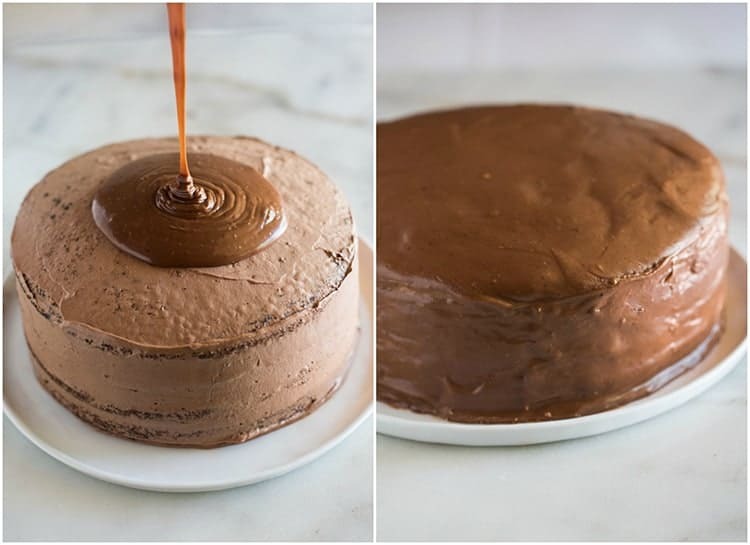 The warm chocolate frosting, similar to a ganache, is made on the stove and gets poured over the assembled cake. Be sure to allow the frosting to cool for at least 15-20 minutes before pouring over the cake. You want it soft enough to still be “pourable” but you don’t want it to be so warm that it melts the mousse into a puddle. You can lay pieces of parchment paper around, and gently under the edges, of the cake to catch the frosting as it drips down. I usually just pour the frosting slowly and catch it as it comes down the sides of the cake, smoothing it along the sides of the cake. This really is the BEST chocolate cake ever. It belongs on a restaurant dessert menu, or in a baking contest, if I do say so myself. It’s a must-try for anyone who loves chocolate! This cake is best stored, covered, in the fridge. The cake rounds can be made in advance and frozen. Once baked, cool them completely and then wrap them in a double layer of plastic wrap. Place them in a freezer ziplock bag and freeze for up to 3 months. The mousse could also be made up to 5 days in advance, stored in the fridge (although its texture is best the day of). 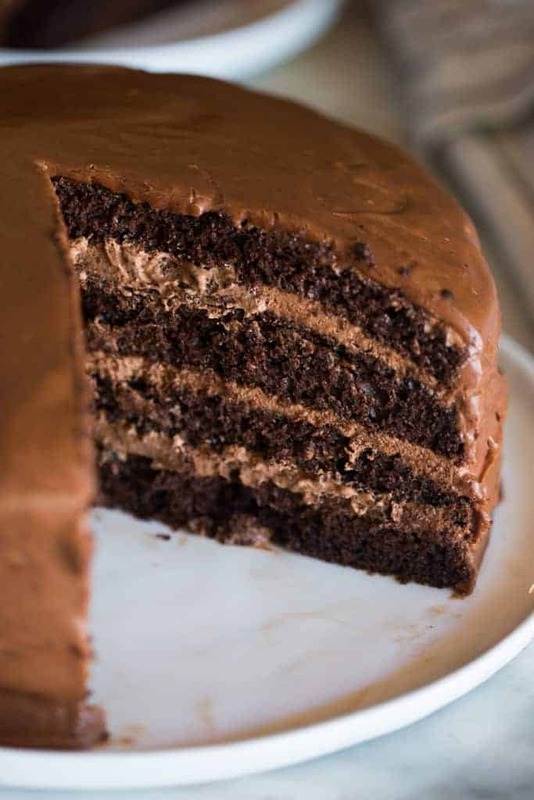 A delicious, moist chocolate cake with layers of dark chocolate mousse filling and a warm chocolate frosting poured on top! Heat oven to 350°F. Grease and flour two 8 or 9 inch round baking pans. (I like to line the bottom of mine with wax or parchment paper). Stir together sugar, flour, cocoa powder, baking powder, baking soda and salt in large bowl. Stir in boiling water (the batter will be thin). Pour batter into prepared pans. Bake for about 30 to 35 minutes or until a toothpick inserted in the center comes out clean. Stir the cocoa powder and hot water together. In a double- boiler (or in the microwave) melt the chocolate chips, just until smooth. Add the cocoa mixture to the melted chocolate chips and stir well to combine. Allow to cool to room temperature. In a separate large bowl, beat the cream and sugar until very stiff peaks form. Add the chocolate mixture and fold in with a spatula until well combined. Refrigerate until ready to use, up to 5 days. In a medium saucepan, add milk, cocoa, and butter. Bring to a boil. Remove from heat. Add powdered sugar and mix with electric beaters to get rid of any lumps. Allow to cool for 15-20 minutes, stirring occasionally. 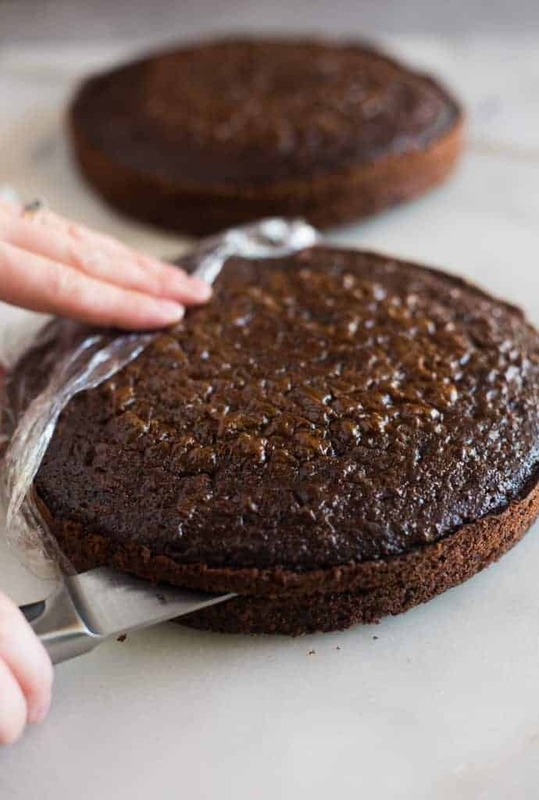 Once cakes have cooled, use a sharp serrated knife to torte each cake (cut each cake evenly in half, horizontally, so that you end up with four, thin, 9'' cake pieces). Place your first cake layer on your cake serving plate. Spread a big spoonful of mousse on top of that cake layer. Repeat with the remaining cake layers, adding a layer of mousse filling between each layer of cake. Use remaining mousse filling to spread it evenly around the entire outside and top of the cake. Refrigerate for 30 minutes. Remove cake from fridge and very slowly pour the cooled chocolate frosting over the top. Use a spatula or knife to gently spread the frosting evenly over the outside of the cake as you pour. Chocolate cake recipe is the Hershey's Chocolate cake. *I first shared this recipe in May 2014. Updated May 2018. It was my first time making Chocolate Mousse. The mousse came out very light and creamy. I can’t wait for my family and friends to try it! I am making it for my son, who will be home for Spring Break. Thanks for the recipe. The cake is cooling in the fridge now. Sure, that should be fine 🙂 Enjoy! Do you think this recipe would work as a cupcake? Sure–you could scoop a small hole inside each cupcake to pipe the mousse in. The cupcakes will bake at the same temp for about 22-25 minutes. I made this for the time and my cakes fell apart. Not your fault of course but if anyone can help me figure out why I’d greatly appreciate it. I made them into cake cups instead since my cakes fell apart. They were too moist.